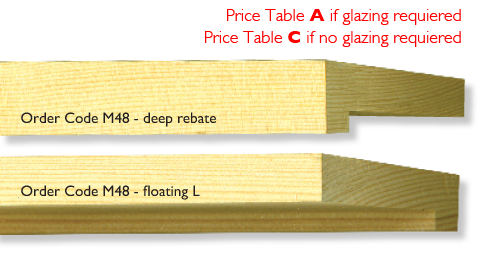 Can be used either way - as a deep rebated moulding - useful for object framing in Box frames, or can be used to surround a deep sided canvase as a floating L. Rebate depth 38mm, the front face measures 20mm DR or 14mm for floating L, and the outside depth is 45mm. Both swan mouldings can be used with slips for a double frame. Please ask for more infomation. They are elegant decorative mouldings which have a rebate deep enough to accommodate most standard bar canvases without glazing or can be made up with glazing or even as a box, we have made the decorative swan up as a bright white box frame, a traditional shape in a contemporary finish. 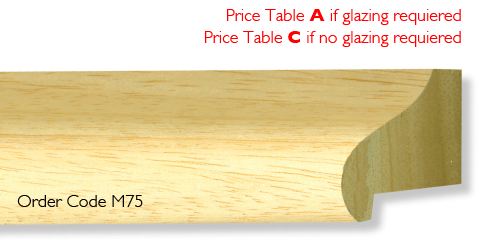 The rebate depth is 32mm, the front face measures 25mm across and the outside edge is 50mm. The smooth swan can be used without glazing to frame a canvas or panel, it has a rebate depth of 24mm and can be used with a slip or inner frame. It could also be glazed and made into a box or Matt mounted style frame. The top of the arch is 25mm across the ouside edge is 35mm deep. The plain obeche mouldings will paint or stain beautifully and will be finished in a colour of your choice.